Was this supposed to be informative? Let me go on a small tangent here to vent my frustration at the Pokémon type chart included in the Red and Blue manual. Keep in mind that, when the first Pokémon games came out, the internet was in its early days, and if you were lucky enough to have internet access in your home, you would have to wait to use it when the rest of your family wasn't using the telephone. Even when you could use the internet, there was no Google and there were no Wikis. So, back then, you could not just pull up a free game guide on your smartphone within 30 seconds and get all your video game questions answered immediately. Without the internet, you would be mostly left with the video game manual. The positive side of these Dark Ages was that you would usually get an entire booklet with your game, sometimes even in full-color depending on how much of a big deal the game was, loaded with official art that wasn't readily available anywhere else. The negative side of all this was... well, look at this chart. 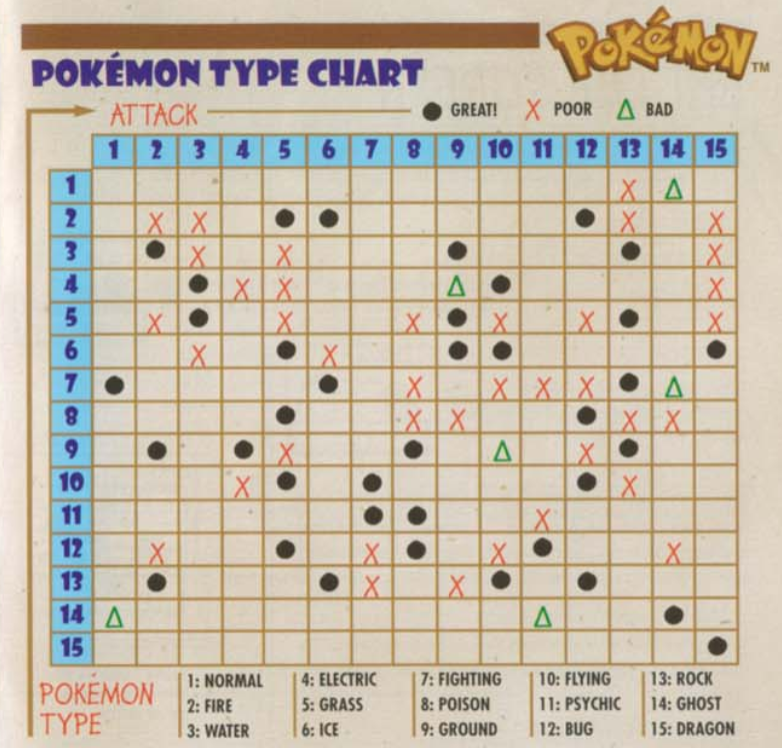 This type chart from the manual was the bane of my childhood existence. Would it have killed them to label the types or explain how to read it at all? Young Me at first I had absolutely no idea what this terrifying tic-tac-toe board even meant. It doesn't come with any explanation or instructions. And even after I figured out what this table was trying to convey, it was much too cumbersome for me to use very well while I was playing the game. The types are all signified by a number, so I would need to look up a type in the legend, find it in the chart, hold my finger there while I looked up the other type's number, map out where the row and column intersected, and then check the other legend to determine if such a type match-up was "Great!" or "Poor" or "Bad", whatever those mean. Is "Poor" better or worse than "Bad"? How does this translate to the in-game messages of "Not very effective?" Who picked these words and symbols? Also, the symbols. "Poor" is designated by a big red X, which obviously signifies badness to me, but "Bad" is a green upward-pointing triangle, which looks positive to me. The symbol for "Great!" is an intimidating black dot that looks bad to me. Though, would these mean that this move is good or bad for me to use, or is it good or bad for the opponent to be hit by? And which way am I even supposed to be reading this? Does the row mean the type of my Pokémon's attack and the column the enemy Pokémon's type, or is it the other way around? 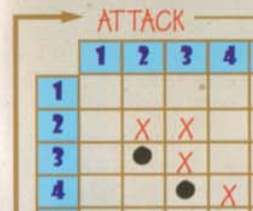 It says "ATTACK" over the column headings, suggesting the columns are the type of the attack, but there is also a horizontal arrow next to the word "ATTACK", so is it actually the rows that signify the type of the attack? I would usually use the Dragon Type to double-check: since I somehow learned that Dragon-type Pokémon are weak to Ice-type moves (probably from the internet), and since nothing else beats the Dragon Type (except itself), and since the Dragon Type is conveniently at the very end of the chart, it would be the easiest column for me to read at a glance, and I could then use that knowledge to orient myself. So, for the record, the row is for the type of your attack, so the arrow is indeed trying to tell you that the attacks are on the rows, even though the "ATTACK" label is over the columns. Couldn't they have put the label sideways by the rows? And they didn't even put a label for what the columns mean at all! Anyway, by the time I had this all straightened out and triangulated, I would have forgotten what I was even trying to look up, so I would then toss the manual back into my dresser drawer. Overall, it was far easier for me to just experiment by trying different move combinations, and learn an intuitive sense of what types are super effective or not very effective against other types. Besides, if I was out and about, I wasn't bringing the game manual with me too, so I was better off knowing the type strategies in my own mind. While I know there are definitely people out there who would be willing to sit down and memorize this type chart, I am not one of them, and I don't think I am in the minority in this -- considering things like this comic exist. All in all, good job Manual People, you fucked it up.